The coordination of methionine methyl ester with dimethyltin(IV) (DMT), dibutyltin(IV) (DBT) and diphenyltin(IV) (DPT) was investigated at 25 °C and 0.1 mol dm-3 ionic strength in water for dimethyltin(IV) and in 50 % dioxane-water mixture for dibutyltin(IV) and diphenyltin(IV). Methionine methyl ester forms 1:1 and 1:2 complexes with diorganotin(IV). The corresponding formation constants were calculated by using the non-linear least-squares program MINIQUAD-75. The concentration distribution of the various complex species was evaluated as a function of pH. The displacement of coordinated methionine methyl ester with some DNA constituents was calculated based on equilibrium aspects. Keywords: Dimethyltin(IV), dibutyltin(IV), diphenyltin(IV), methionine methyl ester, stability constant. A tremendous amount of research is directed towards the design of non-platinum chemotherapeutic agents with the aim to optimize the features of classical platinum drugs containing the basic cisplatin framework, viz. their toxic side effects, inherent intrinsic resistance and high cost.1 Among the most noteworthy cases, organotins have emerged as a promising class of cancer chemotherapeutics. It has been well established that organotin(IV) compounds are very important in cancer chemotherapy because of their apoptotic inducing character.2,3 During the last few years it has been noticed that organotin compounds occupy an important place in cancer chemotherapy.4-7 Blower8 described thirty interesting inorganic pharmaceuticals, four of which are tin compounds. Numerous diorganotin(IV) derivatives have been found to exhibit high in vivo cytotoxicity against P388 lymphocytic leukaemia but to exhibit less or no activity against other murine systems.9-14 However, the new in vitro human tumour cell-screening tests have once again demonstrated the potential of organotin complexes, some of which have exhibited high activity15 and thus interest in them has been revitalized. Organotin(IV) compounds are involved in cancer treatment via different mechanisms at the molecular level. The binding ability of organotin compounds towards DNA, the ultimate drug target, depends on the DNA structure. The phosphate groups of the DNA sugar backbone usually act as an anchoring site and binding at the nitrogens of the DNA bases is extremely effective, thus often resulting in the stabilization of the tin centre as an octahedral stable species.16 The antitumour activity of the coordination compounds R2SnX2L2 is controlled by the nature of R, the leaving group (X) and the ligand (L). The coordinated ligand (L) favours in some way the transport of the drugs into cells, while the antitumour activity is exerted by the diorganotin (IV) moiety dissociated from the complex.17 The latter interacts with nucleic acids, similar to the widely used anticancer drug cisplatin. Therefore, there is a relationship between the stability of the organotin(IV) compounds and their antitumour activity. In conjuction with our previous studies on organotin(IV) complexes,18-22 the present paper aims to study the complex formation equilibria of dimethyltin(IV), dibutyltin(IV) and diphenyltin(IV) with methionine methyl ester. The displacement of coordinated methionine methyl ester with DNA constituents is also investigated. Experimental Organotin(IV) compounds used were dimethyl-tin(IV) dichloride (DMT), dibutyltin(IV) dichloride (DBT) and diphenyltin(IV) dichloride (DPT) obtained from Sigma-Aldrich Chem. Co. Methionine methyl ester hydrochloride and sodium nitrate were obtained from Acros Organics. Carbonate-free NaOH (titrant) was prepared and standardized against potassium hydrogen phthalate solution. 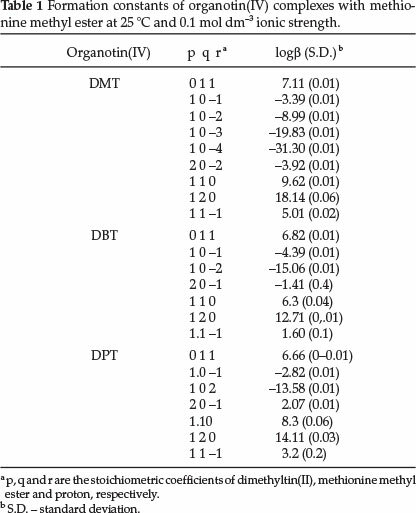 The DMT solution was prepared in water, but the DBT and DPT solutions were prepared in dioxane due to their insolubility in water. The methionine methyl ester solution was prepared in water. Potentiometric measurements were made by using a Metrohm 686 titroprocessor equipped with a 665 Dosimat (Switzerland). The titroprocessor and electrode were calibrated with standard buffer solutions, prepared according to NBS specifications.23 The titrations were carried out in a purified N2 atmosphere by using a previously described titration vessel.24 The temperature was maintained constant by a Colora ultrathermostat. The protonation constants of methionine methyl ester, hydrochloride were determined by titrating a 40 cm3 aliquot of 2.5 x 10-3 mol dm-3 methionine methyl ester hydrochloride solution. The hydrolysis constants of DMT, DBT and DPT were determined by titrating 40 cm3 aliquots of 2.5 x 10-3 mol dm-3 solutions of each substance. The formation constants of the organotin(IV) complexes were determined by titrating 40 cm3 of a solution containing methionine methyl ester hydrochloride (2.5 x 10-3 mol dm-3) and organotin(IV) with a concentration of 1.25 x 10-3 mol dm-3. The titration was performed at 25 °C in water for DMT but in 50 % dioxane-water solution for DBT and DPT. The ionic strength was 0.1 mol dm-3, adjusted with NaNO3. The pK, in dioxane-water solution was determined as described previously.2225 For this purpose, various amounts of a standard NaOH solution were added to a solution containing 0.1 mol dm-3 NaNO3 solution. The [OH-] was calculated from the amount of base added. The [H+] was calculated from the pH value. The product of [OH-] and [H+] was taken. The mean value of pK, obtained in this way was 15.46 for 50 % dioxane-water solution. 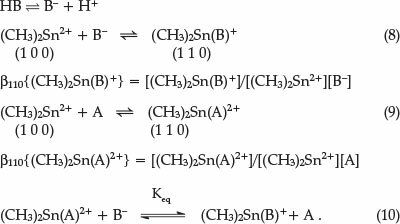 The equilibrium constants were evaluated from the titration data, defined by Eq. (1) and Eq. (2). The potentiometric titration curves of methionine methyl ester in the presence and absence of diorganotin(IV) were compared. The complex titration curve was found to be significantly lower than the methionine methyl ester curve. This corresponds to the formation of a complex species through release of a hydrogen ion. The complex formation equilibria of dimethyltin(IV) with methionine methyl ester were characterized by fitting the potentiometric data to various models. The best model was found to be consistent with the formation of the complexes with stoichiometric coefficients (110), (120) and (11-1). The concentration distribution diagram (Fig. 1) shows that the species 110 is formed at low pH and is predominant at pH 3.4 with a degree of formation of 47 %. After pH 4.0 the monohydroxy species (11-1) and the hydrolyzed species (10-2) start to form and reach the formation percentage of 50 % at pH 8 and pH 8.5, respectively. The hydrolyzed species (10-3) is predominant after pH 11. The hydrolysis of dibutyltin(IV) and diphenyltin(IV) ions was investigated in 50 % dioxane-water solutions. The potentio-metric data was fitted considering the formation of the species (10-1), (10-2) and (20-1). The monohydroxo-bridged dimer (20-1) is assumed to form through dimerization of the tin(IV) via a hydroxo group, as given in Eq. 6.
where R is either a butyl- or phenyl- group. The equilibrium constant for dimerization reaction (6) can be calculated from Eq. (7)33 and amounts to 2.98 for dibutyltin(IV) and 4.89 for diphenyltin(IV). The formation of the dihydroxo-bridged dimer (20-2), found for dimethyltin(IV) is not favoured in the case of diphenyltin(IV) and dibutyltin(IV) ions. This may be accounted for on the basis of a steric interaction effect between the bulky butyl groups in case of dibutyltin(IV) and phenyl groups in case of diphenyl-tin(IV). This will cause the dimeric form (20-2) to be strained and consequently energetically not favoured. The pKa of coordinated water molecules in dibutyltin(IV) and diphenyltin(IV) determined in 50 % dioxane-water solution were compared. The pKa value for diphenyltin(IV) is lower than that of dibutyltin(IV). This may be explained on the premise that the butyl group is electron-donating. This will increase the electron density on the Sn atom and consequently the coordinated water will be weakly bound to Sn. This will make the coordinated water less acidic. However, in diphenyltin(IV), the phenyl group is electron-withdrawing, which will increase the acidity of the coordinated water molecule. The potentiometric data for diphenyltin(IV) and dibutyl-tin(IV) complexes with methionine methyl ester were fitted with a model composed of the species (110) and (120). The hydrolyzed form of the 1:1 complex, (11-1), was not detected in solution, most probably due to its insolubility. The concentration distribution diagram for the dibutyltin(IV) complexes, Fig. 2, shows that the species (110), (20-1) and (120) are formed at low pH. At pH 3.5, the (110) species attains a maximum concentration of 18 %. The (20-1) species reaches a degree of formation of 22 % at pH 4.2. In the physiological pH range, the predominant species are (11-1) and (10-1). The hydrolyzed species (10-2) is formed after pH 10. The concentration distribution diagram for diphenyltin(IV) complexes, Fig. 3, reveals that tin(IV) is hydrolyzed giving the (20-1) species with a maximum degree of formation of 65 % at pH 2.0. This maybe due the high electrophilicity of tin. The (110) complex reaches the maximum concentration of 35 % at pH 3.2. The species, (11-1) and (10-1), are predominant in the physiological pH range and the hydrolyzed species (10-2) is formed after pH 10. The values of logß110 for [(CH3)2SnB]+ complexes, taken from literature22 are given in Table 2. The value of logß110 for [(CH3)2Sn(A)]2+, taken from Table 1 is 9.62 at 25 °C. By substituting into Eq. 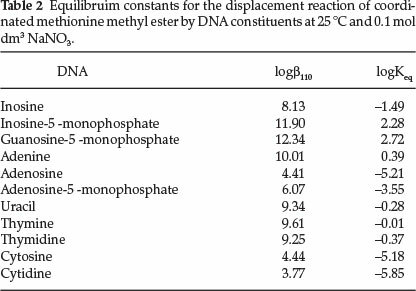 11, the equilibrium constant for the displacement of coordinated methionine methyl ester by DNA constituents are calculated and their values are given in Table 2. These values clearly indicate the ability of DNA to displace methionine methyl ester from its dimethyltin(IV) complex and to what extent the methionine methyl ester complex can interact with the DNA constituents, the main target in tumour chemotherapy. Comparison of the displacement constant values for the different DNA constituents reveals that the nucleotides IMP and GMP have the highest values. This can be explained on the basis of the different coulombic force of attraction between the dipositively charged diorganotin(IV) ion and IMP or GMP having extra negative charges on the phosphate group. The increase of the coulombic force of attraction between diorganotin(IV) and IMP or GMP will facilitate the release of the coordinated methionine methyl ester. The present investigation describes the complex formation equilibria of methionine methyl ester with dimethyltin(IV), dibutyltin(IV) and diphenyltin(IV) ions. The results show the formation of 1:1 and 1:2 complexes. The displacement reaction of methionine methyl ester coordinated to dimethyltin(IV) by DNA constituents was investigated. The results reveal to what extent DNA, the major target in tumour therapy, can displace the coordinated methionine methyl ester and interact with dimethyltin(IV). These data are expected to contribute to the chemistry of organotin(IV) compounds as potential antitumor agents.